The article aims to test the sensitivity of high-resolution mesoscale atmospheric model to fairly reproduce atmospheric processes that were present during the Boothbay Harbor meteotsunami on 28 October 2008. The simulations were performed by the Weather and Research Forecasting (WRF) model at 1-km horizontal grid spacing by varying initial conditions (ICs) and lateral boundary conditions (LBCs), nesting strategy, simulation lead time and microphysics and convective parameterizations. It seems that the simulations that used higher-resolution IC and LBC were more successful in reproduction of precipitation zone and surface pressure oscillations caused by internal gravity waves observed during the event. The results were very sensitive to the simulation lead time and to the choice of convective parameterization, while the choice of microphysics parameterization and the type of nesting strategy (one-way or two-way) was less important for reproducibility of the event. The success of the WRF model appears limited to very short-range forecasting, most advanced parameterizations, and very high-resolution grid spacing; therefore, the applicability of present atmospheric mesoscale models to future operational meteotsunami warning systems still has a lot of room for improvements. We would like to thank NOAA and the Gulf of Maine Research Institute, in particular John Jensenius and Linda Mangum, who provided us with the data observed at GoMOOS/NERACOOS buoys during the event (http://neracoos.org). Croatian Meteorological and Hydrological Service accounted for the provision of computational resources for numerical simulations. 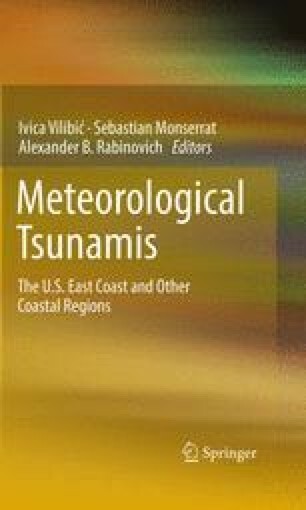 This work was performed within the NOAA/NWS project “Towards a meteotsunami warning system along the US coastline (TMEWS)”, Award No. NA11NWS4670005. We are grateful to two anonymous reviewers for comments and suggestions that improved the manuscript.